Protein is the most abundant supplement in the fitness industry, so you better know your brands, your ingredients and how they affect your body. The last thing you need in your quest to improve your health and fitness is to wander aimlessly through the aisles of your local supplement store. 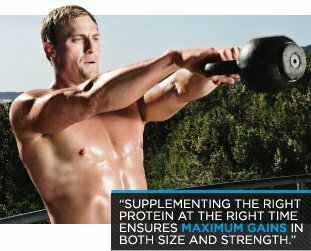 With that in mind, Men's Fitness has polled our experts and advisers to come up with this supplement buyer's guide. The following article will help you decide which protein supplements you need to enhance your workout and achieve the results you've always dreamed of - fast! Protein in a mass-building or get-lean diet is a lot like a mutual fund or a 401(k) plan: You know you need it, but you're not always sure which one to pick. There are simply so many of them. But just as diversifying your investment portfolio is crucial to long-term wealth, so too is including a variety of different proteins in your daily meal plan. The proteins found in whole foods like beef, poultry, fish, and dairy are vital, but so are those found in protein powders, bars and ready-made shakes. The problem is, with the growth of the supplement industry in the past couple of decades, there seem to be just as many different proteins in stores as there are mutual funds on Wall Street. Therefore, we've put together this guide to navigating your way through the different tubs, bars and shakes present in the protein marketplace today. Assuming you don't have ample time (or desire) to prep every meal and snack, convenience is a big deal. And that's where meal replacement bars come in handy. If you're hurrying out the door for work, throw a bar in your bag. If you're afraid of getting stuck in the office with nothing healthy to eat, keep a box of bars at your desk. Many bars on the market these days include protein, fats, and carbs, making these a bars a small meal to tide you over until the next one. Plus, there are a number of low-carb bars available that include sugar alcohols, which aren't readily absorbed in the body like regular sugars. Because the protein doesn't absorb as fast as in liquid form, bars aren't ideal pre- and post-workout, but otherwise, they're fine to include in your diet in moderation. When it comes to building muscle, nothing beats whey. It's the best protein for stimulating muscle gains before and after workouts. The best whey powders on the market contain whey protein isolate (WPI) and/or whey protein hydrolysates (WPH)-these are the purest forms of whey, they digest the quickest, and they get to your muscles fast. Whey protein concentrate (WPC) is good, too, but it contains higher amounts of carbs and fats, which slows its breakdown. So when it comes to making that initial muscle-building supplement purchase, start with a protein powder that's either 100% whey or a blend with whey as its first ingredient. Whey is great because of its fast-absorbing nature, but there's certainly a time for a slower-digesting protein as well, namely casein. Casein is ideal before bedtime for providing a steady trickle of aminos during your overnight fast, and it's even been found to enhance muscle building when added to whey in a post-workout shake. Look for a powder that includes micellar casein, the slowest digesting casein of them all (forms listed as "caseinates" are good as well). Bottom line: any smart supplement plan includes casein. Take out most of the carbs and fat in milk, and you end up with a product known as milk protein. Milk protein is 80% casein and 20% whey, so it's relatively slow digesting. A mixed protein powder that includes milk protein can still be fine pre- and post-workout, as long as whey is listed before it on the ingredients list. When shopping, look for the words milk protein isolate, which designates its purest form, or milk protein concentrate. Before whey was discovered, this was the protein of choice. Egg white protein is very high quality, and in terms of speed of digestion, it's slower than whey but faster than casein. So while on its own it's not the best around workout time, a mixed powder containing egg white, whey, and casein protein can be effective at virtually any time of the day. In other words, you'll be supplying your body with a combination of fast-, slow-, and medium-digesting proteins to keep muscles growing at all times. Rest assured, we're not talking about beef bouillon cubes here or anything that tastes remotely like red meat. (Ironically, it comes in fruit flavors.) Beef protein powder, as the name implies, comes from actual beef that's had nearly all of its fat stripped away. As a result, it digests very quickly, making it a worthy substitution for whey for those who have a milk-protein allergy. While soy protein isolate is fairly fast digesting, its real benefit is its ability to boost nitric oxide levels, increase growth hormone release, and aid muscle recovery following workouts. And if there is still any doubt about its effects on testosterone and estrogen levels, let us confirm that the latest research concludes suggests that soy does not decrease testosterone or raise estrogen levels in men. Once again, we're talking about convenience, and RTDs are very low maintenance. Just crack the top and drink. Like bars, RTDs travel well and store easily at your workplace, also, they're always better when chilled. Though not a horrible choice around workouts, RTDs still aren't your best bet before or after training; they typically contain just milk protein, which is 80% casein (the slow-digesting stuff). When possible, save them for snacks. TIP - Always include some simple carbohydrates in your post-workout shake to ensure maximum growth.